» Symbology: How is this flag used today? Where can I buy this flag? In February 15th 1669 the General Council of the Kingdom of Galicia declared that "(...) from then onwards it was decided to erase the green dragon and the red lion (arms of the Swabian kings who ruled this country at the time) and bring onto the golden field of the arms the consecrated wafer (...)". This document describing the flag of the Swabian kings of Galicia was was brought back to the public eye in 1927 by historian Pérez Constanti in his book "Notas Viejas Galicianas" (Ancient texts from Galicia). 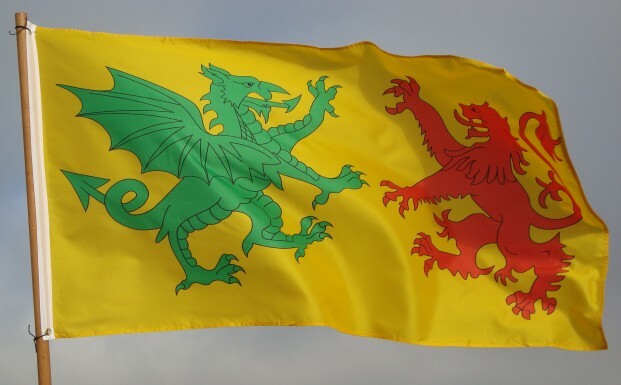 Based on that historical description from the Council of the Kingdom of Galicia in 1669 we have made a modern flag featuring a green dragon and a red lion over a gold field. The position on the flag of the dragon and the lion has been determined according the common features of European heraldry, which is two rampant beasts facing and confronting each other. This is a historical flag which can be used for a wide variety of purposes such as decoration of re-enactment and historical festivals, personal use and collection, adding a colourful touch to social meetings and events, etc... This flag can also be used as a historical symbol by many territories which used to be part of the ancient Kingdom of Gallaecia: modern Galicia, northern Portugal, and the neighbouring regions of Bierzo, Asturias, and Leon. Between AD 407 and 410 several thousand Swabian-Germans arrived to the Celtic territory of Gallaecia and took over the control of the province from the Roman Empire. The first Swabian king Hermeric became the first feudal king of Medieval Europe after unifying all the Celtic tribes of the province. 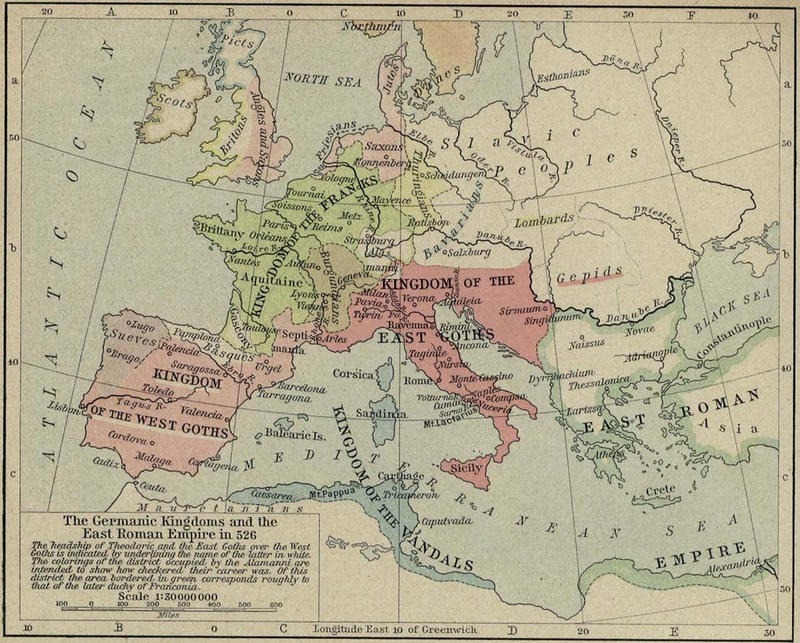 That kingdom was known in Europe with the names of Galliciense Regnum (Kingdom of Gallaecia) or Regnum Suevorum (Kingdom of the Swabians). For almost 200 years, the Swabian Royal Dynasty governed the Kingdom of Gallaecia, creating a Galician national currency system and a Galician Church, and establishing a foreign policy of alliances with Burgundy and Constantinople. The Swabian Dinasty also conquered and expanded the territorial borders of Gallaecia out to Hispania Betica (southern Spain), Lusitania (Portugal) and Hispania Tarraconensis (eastern Spain). The Swabian Dinasty was dethroned after King Andeca of Gallaecia was defeated in battle by Hispanic-Visigothic king Leovigild in AD 585. The Visigothic dynasty became then the new ruling house of the Kingdom of Gallaecia and king Leovigild took the title of king of Gallaecia, Hispania et Narbonensis". Years later, his successor, king Recaredus, was still addressed by Pope Gregorius Magnus as "King of the Goths and of the Swabians. The Swabian Dynasty was credited for unifying and bringing together all the Celtic tribes of Gallaecia into a kingdom that was known thereafter as "Kingdom of Galicia". An example from our Scottish cousins: Scottish football supporters cheer their national team by waving both the blue Scottish Saltire and the yellow Royal Flag of Scotland. Symbology: How is this flag used today? 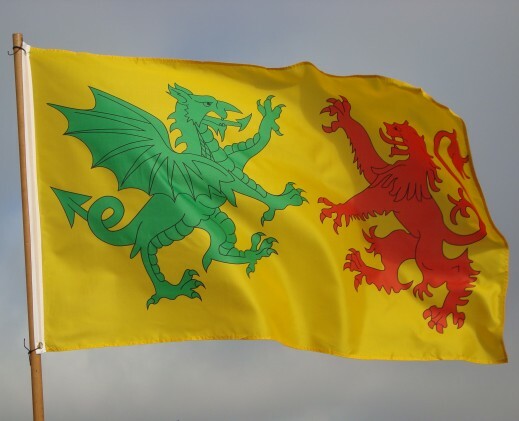 The Flag of the Swabian Kings of Gallaecia is increasingly becoming a very popular icon among those interested in Galician history and the Galician national symbols. The rampant beasts depicted in the flag -the dragon and the lion- are found regularly in Galician heraldry (the lion) and popular folclore (the dragon). Many people simply like the looks of the flag and are using it as an alternative flag for Galicia, in a similar manner as they do in Scotland with their blue Scottish Saltire and their yellow Royal Banner. 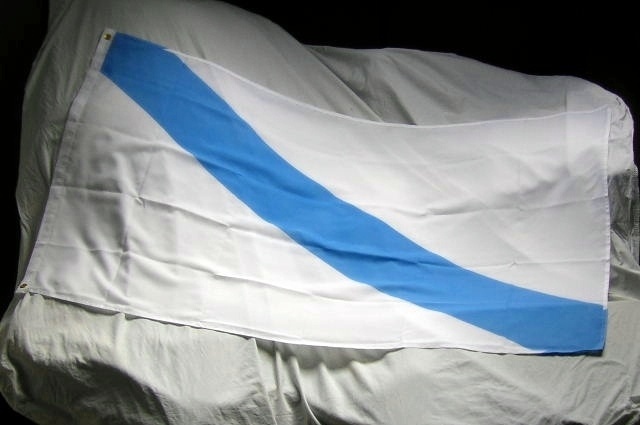 This flag is also a historical symbol which is shared by many other territories which used to be part of the ancient Kingdom of Gallaecia: modern Galicia, northern Portugal, and the neighbouring regions of Bierzo, Asturias, and Leon. » Size: 150x90 cm (3'x5'). Material: polyester. » Two side metal rings allow the flag to be hoisted on a flagpole.